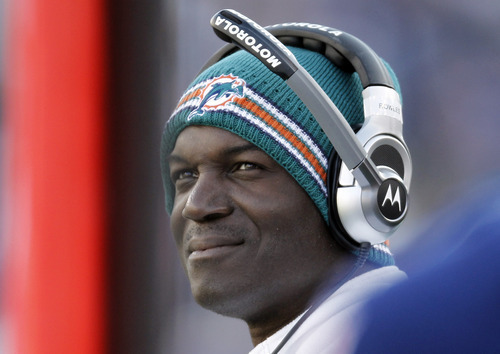 Todd Bowles is 6’2”, 203 lbs. Well, at least he was that big when he played in the NFL as a free safety for eight years. Normally, the height and weight of a coach wouldn’t matter much. 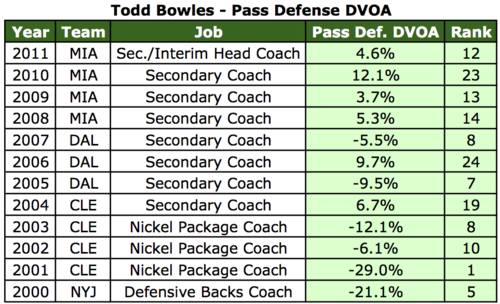 But in the case of Bowles, we can draw a clear line between his frame and his personnel preferences as a secondary coach. As you can see at right, teams where Bowles has been the secondary coach consistently draft tall defensive backs (the same way Jim Washburn only picked tall defensive ends). 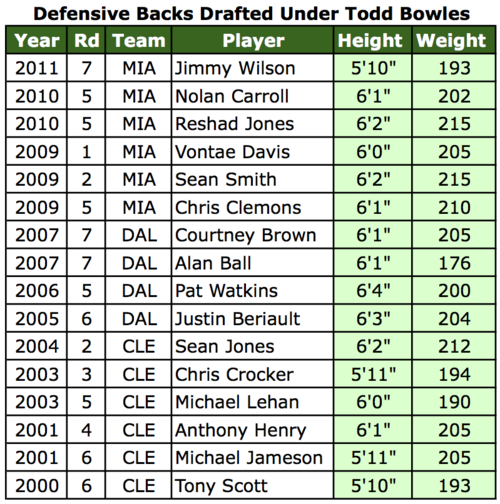 In fact, he’s only drafted one defensive back under six feet since 2003, and that was in the seventh round. Clearly, Bowles’s preference is for bigger, more physical players. He probably would not, for example, have endorsed the selections of Sheldon Brown and Lito Sheppard, two 5’10” corners. More relevant: Asante Samuel is not the type of cornerback Bowles had in mind as his prototypical starter. As I’ve mentioned before, the Samuel trade was about ego, a broken locker room, and justifying the 2011 personnel decisions — not on-the-field performance or the salary cap. But I doubt Bowles was campaigning for Samuel to stick around. Instead, he’s probably quite content with his starters at cornerback for 2012. Nnamdi Asomugha is 6’2”, 210 lbs and Dominique Rodgers-Cromartie is 6’2”, 182 lbs. Hopefully Bowles can help mold a solid defensive backfield around the two of them. Curtis Marsh also stands to gain quite a lot from the Bowles hire, since his athletic 6’1”, 197 lbs frame would be perfect for his new coach’s system. On the other hand, Kurt Coleman probably shouldn’t get too comfortable as a starter. I’ve discussed his athletic limitations before, but Bowles may be particularly keen to find someone with a higher ceiling. The counter-example of course, is 5’9” Brandon Boykin, whose selection Bowles must have approved. But perhaps he is willing to make an exception for the physical slot corner, regardless of his size, given the value he presented in the fourth round. Tagged with Philadelphia Eagles, NFL, Defensive Backs, Cornerback, Safety, Coaching, Todd Bowles, Height, Asante Samuel, Nnamdi Asomugha, Dominique Rodgers-Cromartie, Curtis Marsh, Kurt Coleman, Brandon Boykin, NFL Draft, Statistics, Football Outsiders, DVOA. July 17, 2012 by Brian Solomon.